Educator Professional Development opportunity! Citizen science can be a fun and engaging way to bring real research projects into your classroom. Explore how to use citizen science to bring STEM careers into your classroom while highlighting key NGSS practices. How have participants integrated discussion of STEM careers in the classroom? Learn and discuss issues facing the STEM pipeline and stereotypes surround STEM jobs. How can citizen science projects be used to integrate STEM careers into the classroom? Learn about a handful of citizen science projects, the organizations that run them, and the careers behind the projects. Bring hands-on experience into the classroom that has real world applications and allows students to contribute to ongoing research. 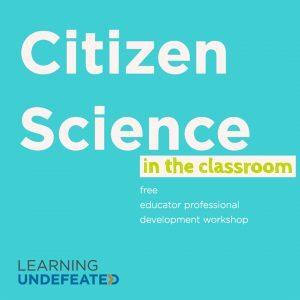 Explore how citizen science projects can be used to boost classroom learning about data collection, analysis, and interpretation. Discuss and explore how individual teachers or schools can design and set up their own projects in their community to build their own long-term data sets.